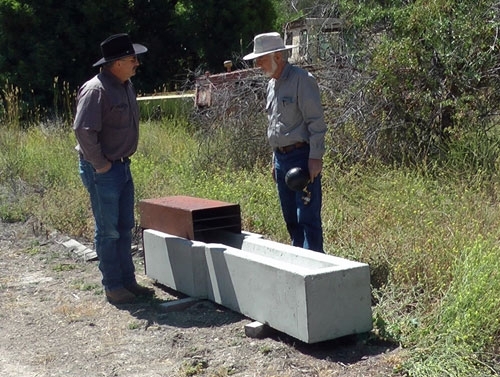 UC Cooperative Extension rangeland farm advisor Royce Larsen, left, discusses the ground-level water trough with inventor George Work. California’s vast dry rangelands are dotted with water troughs ideal for quenching cattle’s thirst. But in most cases, the troughs’ designs are a torment to wildlife drawn for a drink. Monterey County rancher George Work observed how traditional water troughs frustrated the wildlife on his family’s 12,000-acre cattle ranch. Small birds couldn’t reach water two or three inches below the top edge. Coyotes, bobcats and cottontails weren’t tall enough to reach over the rim. Work set to making a water trough that would meet the needs of all animals on the range – from cattle, hunting dogs and horses to deer and rabbits. While raising cattle remains the primary function of the Work Ranch, in order to generate more income from the scenic open space the ranch opens its doors to hunting wild boar, quail and Tule elk. The visitors enjoy seeing a diversity of wildlife. “One-third of our business comes from wildlife,” Work said. In 1998, Work drew from decades of first-hand experience to design a better water trough. With a grant from USDA’s Natural Resources Conservation Service, he constructed a prototype. The concrete trough is sunk into the ground under an elderberry tree. Work modified a float like those used in toilet tanks to keep the water within centimeters of the rim. That first man-made watering hole was an improvement for many species, but it also revealed some problems. Birds needed an escape ramp to climb out of the water should they fall in while drinking; the ramp should be shallow enough to allow the birds to bathe. Larger animals had to be kept from using the trough for a cooling dip. Work found that sloping the sides to a sharp V at the bottom of the trough made it unappealing for a soak. Years of experimentation and innovation resulted in the development of pre-manufactured concrete water troughs, which are now commercially available. The next challenge is selling the idea to ranchers. Enter UC Cooperative Extension. 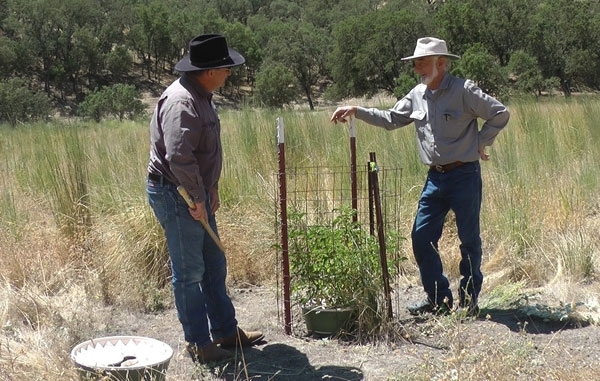 On an unrelated visit to the Work Ranch, UC Berkeley wildlife biologist Reg Barrett was impressed by Work’s invention and encouraged UC Cooperative Extension rangeland advisor Royce Larsen and NRCS rangeland conservationist Karl Striby to help spread the word. Larsen and Stirby are now completing the first step, adding the ground-level water trough specifications to NRCS's published Technical Notes. The publication will provide ranchers and other land owners with the information they need to install the wildlife-friendly troughs. In the video below, rancher George Work shows the ground-level water trough prototype and the second-generation, pre-manufactured version. An elderberry growing in a Waterboxx. For more than 100 years, Californians have been concerned about inadequate regeneration of trees and shrubs on oak woodlands. Firewood harvesting, agricultural conversions and intensive grazing threaten to convert woodlands into shrub fields or bare pastures. The beauty of rolling hills studded with majestic oaks, other trees and shrubbery isn't the only reason to regenerate vegetation. The trees and shrubs create a much more hospitable habitat for a wide assortment of wildlife. Oak woodland vegetation also protects the quality of California water. The majority of the state’s water flows through oak woodlands in streams and rivers that support fisheries, farms and cities. Plants and trees anchor the soil, preventing erosion and stream sedimentation. One of the difficulties ranchers face in regenerating trees is supplying water for seedling establishment. Ranches often stretch for thousands of acres. Hauling water to remote sites or installing irrigation can be prohibitively expensive. Natural resources advisor Royce Larsen, left, and rancher George Work discuss the growth of an elderberry in a Waterboxx. Third-generation San Miguel rancher George Work heard about a new tree establishment invention from Holland – a Groasis Waterboxx. 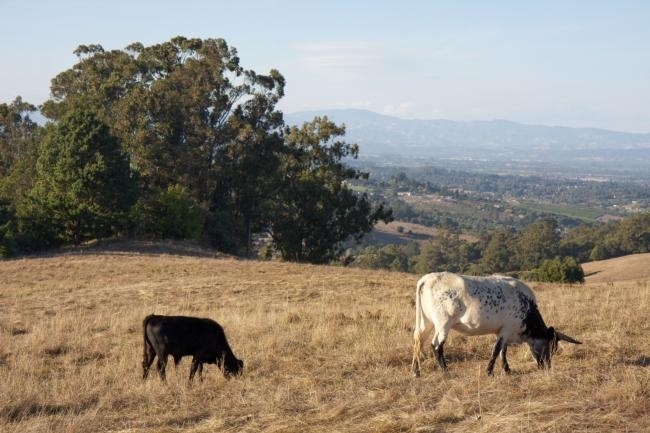 Over the years, Work has collaborated with UC Cooperative Extension on oak planting projects and consulted with UCCE experts about squirrel diseases, ranch animal vaccinations and pasture management. 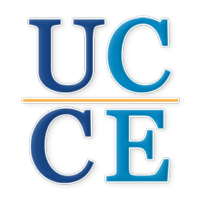 He turned to UCCE natural resources advisor Royce Larsen for his thoughts on the Waterboxx. Work, Larsen and UC Cooperative Extension natural resources specialist Bill Tietje installed 10 Waterboxxes, which cost about $30 each, in a remote area of the 12,000-acre Work Ranch in southern Monterey County. Other plant regeneration methods – including traditional drip irrigation and tree teepees – were also installed for comparison. 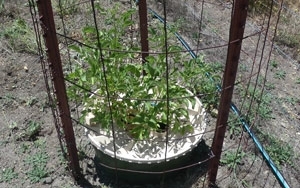 The Waterboxx is a round plastic hat box-shaped reservoir that fits around the seedling trunk. When the seedling is planted, the reservoir is filled with about four gallons of water. A rope on the bottom continuously wicks moisture to the plant roots. The box is covered with an inward-slanting corrugated top that cools during the night and channels condensed dew and fog into the reservoir, keeping it full of water. The Waterboxx provides a protective barrier around the trunk and shades and cools the soil beneath. At the Work Ranch, the plants are also enclosed in bale-wire fence to keep out wildlife poking around for water or hungry for tender green growth. “The trees are doing surprisingly well," Larsen said. "In just three months, the seedlings have grown more than two feet." Larsen said he will continue monitoring the project to see if the self-watering system can establish trees. 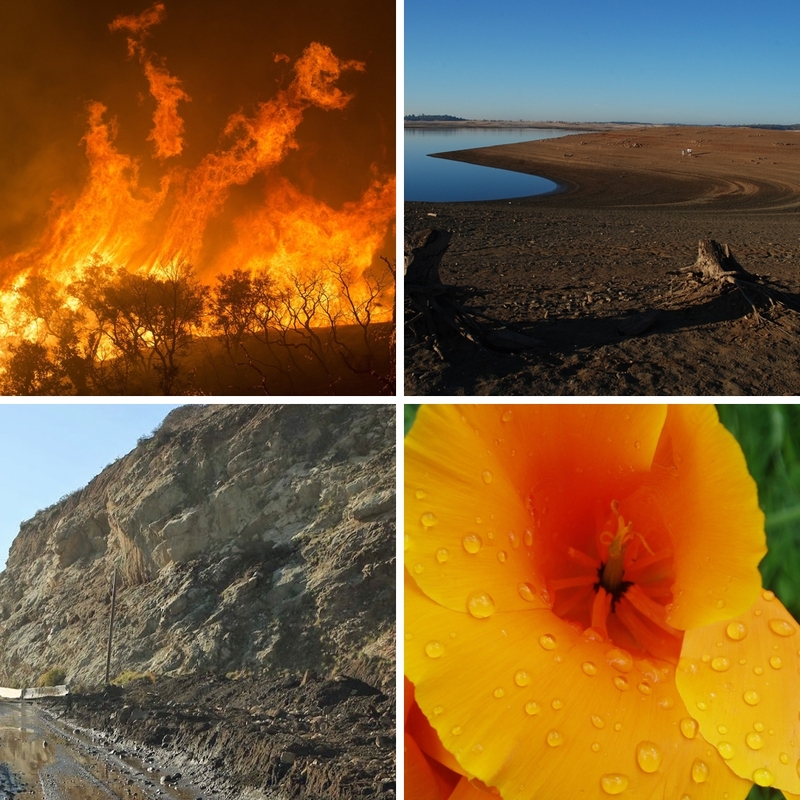 If successful, UC scientists may study the Waterboxx more thoroughly in a replicated research design in Monterey County, San Luis Obispo County and other parts of the state. See the components of a Waterboxx in the video clip below.